Origin: Brought by the Greeks to southern Italy over 2,000 years ago. Description: Aglianico is deep ruby in color with black fruit and earth aromas. Powerful and broadly structured with firm tannins and a long finish. Aging: Bouquet and mid-palate develop in three to five years, but continue to improve for ten. At maturity, Aglianico displays a deep garnet color and rich, satiny texture with aromas of coffee and leather. 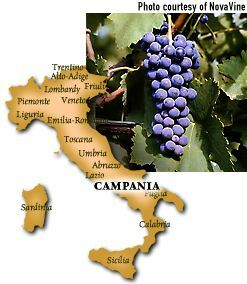 Best location: Volcanic soils in warm-to-hot climates - e.g., TAURASI in Campania and AGLIANICO DEL VULTURE in Basilicata. FastFoodFacts: Roasted lamb with garlic, savory/spicy stews, aged sharp cheeses (Gouda, Jack, Asiago, Provolone).